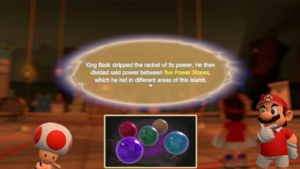 The Power Stones are remnants of Lucien seen in the Adventure Mode of Mario Tennis Aces. When the Kingdom of Bask fell into ruin, King Bask split Lucien's power amongst these stones to minimize its power. Afterwards, when an oblivious Wario and Waluigi stole Lucien, Aster tasked Mario to find as many Power Stones as possible. In the end, Mario managed to collect three Power Stones, whereas Lucien's puppets managed to steal two. Lucien then declared the Lucien Cup at Marina Stadium to determine who would claim possession of the remaining Power Stones. Even though Mario's team won, Bowser managed to steal all of the Power Stones to restore Lucien's power, fusing them into Bowcien. After a long, hard battle, Mario defeated Bowcien and caused the Temple of Bask to fall to ruin with Lucien and the Power Stones. The Power Stones are not seen again after that. Despite the Power Stones all being unique colors, the only Power Stone seen in-game was the indigo one, stuck within the Bowser Statue. The color of the Power Stones resembles the colors of the Infinity Stones from Avengers: Infinity War, with one of the stones being named the Power Stone, and the stones fitting in Lucien similarly to how they fit into the Infinity Gauntlet in said movie. This page was last edited on November 24, 2018, at 21:38.